Double Peanut Butter Molten Lava Cakes are an easy recipe that looks complicated but is quite the opposite. They are loaded with peanut butter goodness, rich and creamy in the center and perfect when in need of a fancy looking dessert. This is my absolute best recipe invention to date! Mr. Wishes and I came up with this one together being the huge peanut butter lovers that we are. Everyone at one point in time has had molten chocolate lava cakes that ooze more chocolate when cut open….maybe even a chocolate lava cake with peanut butter filling in the middle. I must ask, though, have you ever had a peanut butter molten lava cake with peanut butter filling?! 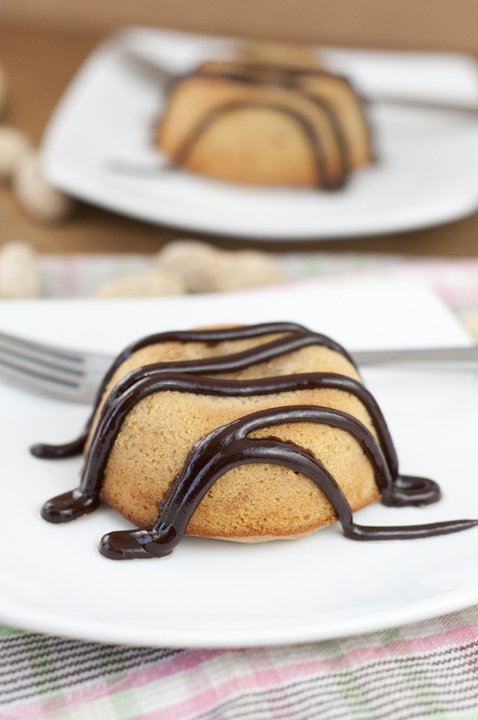 These Double Peanut Butter Molten Lava Cakes are the most mouth-watering treat I have had in ages. 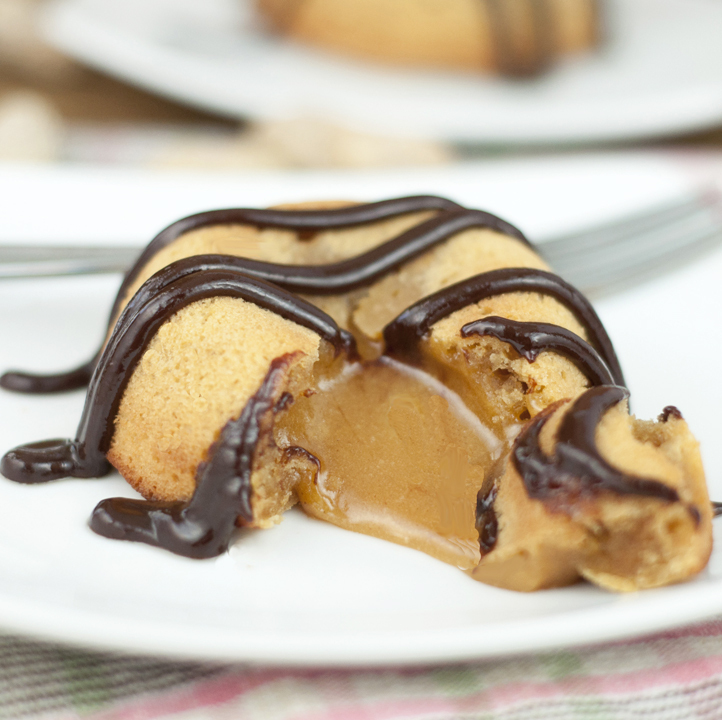 If you can’t get enough peanut butter in your life then double peanut butter molten lava cakes are for you. The drizzle of chocolate ganache on top is just enough to give you that heavenly combination of chocolate and peanut butter. This creates the perfect marriage of flavors and a party in your mouth. Side note: isn’t that ganache just so shiny and beautiful? I rarely make the bold statement of calling something the “best”, but this my friends, is the BEST. Well, are you running to the kitchen yet to make your new favorite dessert? 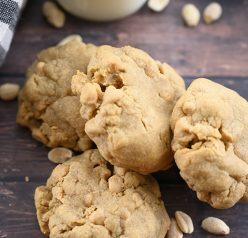 If you’re loving on the peanut butter desserts (like I tend to), you will have to check out my collection of Peanut Butter Dessert recipes. I’m very partial to my Reese’s Double Peanut Butter Layer Cake that I make for Mr. Wishes’ birthday each year and my Peanut Butter Buckeye Bark. The bark is so easy to make and everyone loves it. You might also like this Amish Peanut Butter Pie from my friend Brandy! Melt the peanut butter, peanut butter chips, and butter together in a microwave-safe bowl (about a minute or a little bit more). Stir after a minute and if not completely smooth, microwave a little longer. After mixture is completely smooth, add the sugar and mix well. Add the eggs and egg yolks, one at a time, and whisk vigorously after adding each egg until well incorporated. Spray 4 custard cups very well with non-stick spray then place onto a baking sheet. Pour peanut butter batter evenly into cups then bake for 12-13 minutes, or until the sides are set but center is still soft (but not extremely jiggly.) Middle will look not quite done, but sides should be set. Let cool for 2 or 3 minutes, then invert cakes onto serving plates. They should come right out, but if needed, run a small knife around edges to loosen. Drizzle chocolate ganache over the top and serve warm (this is imperative or the peanut butter won't be melty when cut open)! Place chocolate chips in a small bowl and set aside. In a small saucepan, bring cream just to a boil. Pour over chocolate; whisk until smooth. Cool the ganache, stirring occasionally, until mixture is slightly thickened, about 40 minutes. Pour over cakes using a spoon or you can pipe onto cakes using a ziploc bag with the corner snipped off. Yield: 1-1/4 cups. You are a genius! I am in peanut butter heaven. As a huge peanut butter fan, I am dying to try this. Great job, Ashley! Bookmarked! I can’t wait to make this. The more peanut butter the better! Oh, wow! This is sinful stuff. My kind. 😉 Really good — thanks. Oh my….I never thought that a chocolate molten cake could be topped…but I think you’ve done it with this recipe Ashley! This looks delicious! yo dis so dope, gonna get me soma dis treat. lookin real fine girl. I’m a peanut butter lover, too, and just looking at that photo has my mouth watering. How delicious! I still have yet to make lava cakes at home! I need to do it. And with peanut butter and chocolate?? These look sooo good! That looks like double the deliciousness right there. Oooh! This is amazing! 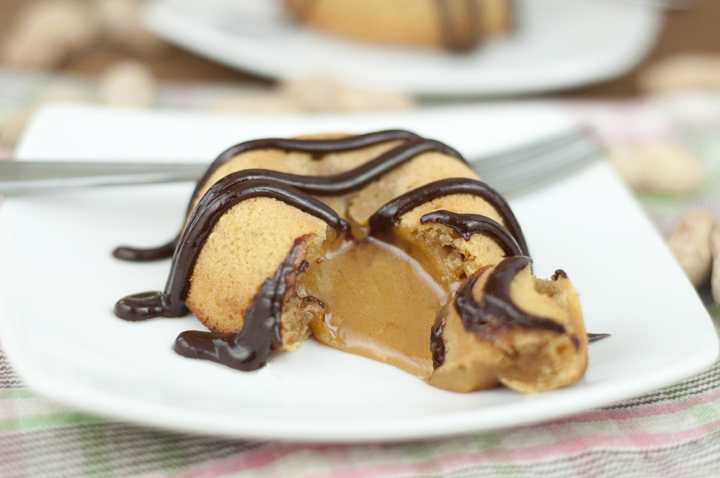 These are the first double peanut butter lava cakes I’ve seen and they look so, so good. You should win an award for this recipe! Maybe a blue ribbon even. It looks amazing! 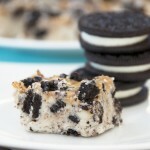 Ummmmmm I think you just invented my new favorite dessert. I love peanut butter so much you don’t even know. I need this right now! Oh my word! This is the most heavenly thing I’ve seen in a loooong time. That peanut butter center is everything! Pinning! SUCH a genius idea!!! 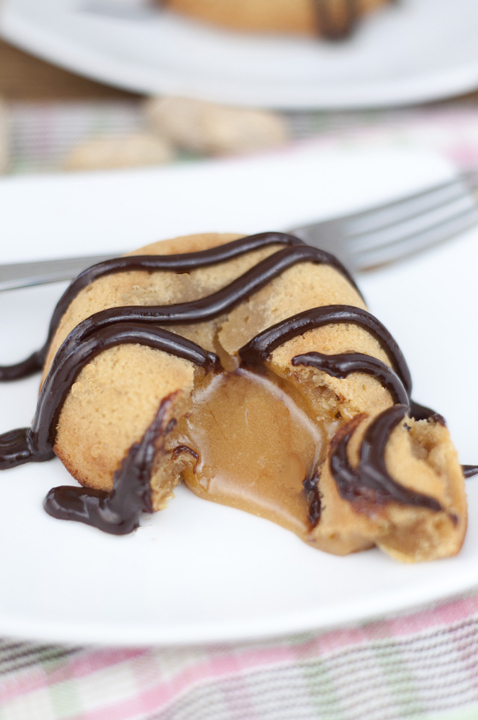 I totally die over that peanut butter molten middle! Oh my word these look amazing!!! Oh my gosh! I’m so sorry. It was in there at one point I know – I added it in! Sorry about that! I have always wanted to try making molten lava cakes!! This looks delicious!!! I am making this tomorrow. Why not natural peanut butter? Thats all I ever use! It just is much more oily! I supposed you could try it though. These lava cakes were a delicious hit! I used natural peanut butter and avoided the floating oil and it was great! I think the ganache ingredients could be cut in half. I had a ton left over. Thank you for this recipe! 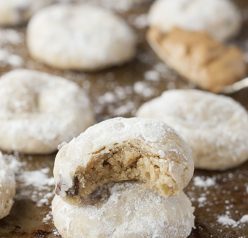 Can you make these a day ahead of time and then serve them? I wouldn’t only because you wouldn’t get the gooey peanut butter effect.